← Is Turkey a Reason to Sell EM? U.S. stocks’ rocky week. The S&P 500 Index is poised for its most volatile week since early June as investors have taken cues from overseas developments. While the index is up 0.3% so far this week, it has posted average daily moves of 0.7% over the period. Today could be another volatile day for U.S. investors with major indexes retracing some of yesterday’s gains in early trading. More international headlines. The Turkish lira resumed its slide as Turkey’s government announced new, looser rules on bank and corporate debt, while the U.S. threatened more sanctions if Turkey doesn’t “quickly release” a detained American pastor. The U.S. and China’s back-and-forth on trade also continued as President Trump put pressure on China to sweeten the trade deal before a meeting between the two countries later this month. 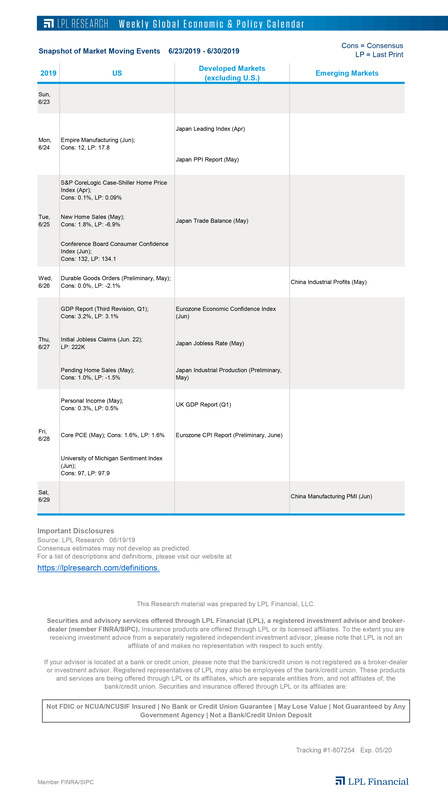 We continue to believe the U.S. and China will reach an agreement on trade before significant tariffs are imposed, but trade headlines could cause turbulence in U.S. equities. Close, but no cigar. The S&P 500 has closed within 2% of record highs for 11 consecutive trading days, the longest such streak since September 2017. We’re optimistic that the index will break out to new highs soon as reports show a solidifying macro backdrop and another strong earnings season wraps up. However, it is the historically troublesome month of August, and stocks may consolidate near record highs for longer amid low volume before we see new records. Potential trend reversals in the U.S. dollar and emerging market stocks. From a technical analysis perspective, we are beginning to see potential long-term trend reversals on both the U.S. dollar and the MSCI Emerging Markets Index. Today on the LPL Research blog, we examine what investors could expect in emerging-market stocks based on seeing these trend reversals historically. International investing involves special risks such as currency fluctuation and political instability dn may not be suitable for all investors. These risks are often heightened for investments in emerging markets.